One nation dedicated to motorsports, politics, music, social commentary, weirdo art, science fiction, home repairs, cooking and counterculture ephemera. Why is there so much brouhaha over the Indianapolis 500? 'What', some of my friends ask me, ' is the big deal about a bunch of ugly race cars going around a track in circles? Driving a car isn't a sport, so what's all the fuss about?' What indeed. For me, the 500 was an important event that my Dad taught me about, him being an old skool racing fan as well. I reckon that would explain why, when Indy and Formula One ace Jimmy Clark was killed in the late 1960's, I went to grade school wearing a Black armband in tribute for an entire week. My friends thought I was nuts, and they were probably right. The 500 was always broadcast on ABC's 'Wide World of Sports' as long as could remember, although they usually interspersed it with weightlifting from Brussels and a soccer game from Caracas. Whatever... as long as they showed the bulk of the racing, we'd be OK. But all that is relative, as nowadays the race has become (is still?) one of the great spectacles in sports, not just racing. Although a 1996 rift in the open-wheel racing world hurt the race badly for over a dozen years, The Indy 500 has reclaimed almost all the former glory it once had, but the nagging question remains: Why? Why does this race inspire and madden and possess drivers who yearn to compete and win at the hallowed facility? How does a team find the gumption to return year after year, sometimes qualifying and sometimes not, without hesitation or pause? Why do fans like me get crazy eyes on that Sunday morning, frothing with anticipation and making sure we have plenty of grub and beverages so as not to miss a minute of it? Why? WHY?!?! Well, the answer is complicated. As a motorsports fanatic, I may not be able to offer an objective opinion, so let me dance around the hard-nuts of the thing to bring it into perspective. Naturally, there's the whole 'amazing science' aspect of driving a car at over 220 miles an hour on a closed course... speed, momentum, friction, aerodynamics, slip angles, traction, weight transfer, physics... everything that makes science fun and intriguing is present and accounted for. But it's more than all that. A short story: in 1994, I was working as a technical specialist for NGK Spark Plugs while attending a humongous snowmobile race in Northern Wisconsin... in JANUARY. Average temperature in the bright sunlight was 35 degrees below zero. One morning I was sitting in the hotel restaurant with my co-worker, girding ourselves for a long cold day working in the pits, when in walks Stan Fox, one of the great Indy 500 competitors, who promptly sits down to chow down some oatmeal. Turns out he was also there for the snomo races, him being a Wisconsin native and all, and since I recognized him immediately and offered to buy him breakfast, he plopped down at our table and we spent the next hour talking racing. Stan was one of those classic owner/drivers who spent an entire year getting ready to try and qualify and race in the 500, always short on funds but long on skill. He mentioned that he was struggling to get sponsorship for that year's race, but that come hell or high water, he'd be there. Sure enough, he qualified 13th and finished 13th, although he crashed out right at the end of the race. Not bad, but the following year he suffered a horrific crash on the front stretch, most notable for the outrageous image of his demolished car flying backwards, chest-high, the front end ripped off and his legs dangling in the wind, soon to be badly mangled. That race ended his chances to race at Indy again, but he continued to race road courses and sprint car tracks around the world until he lost his life in a New Zealand highway traffic accident while driving his own race transporter to yet another no-name race. R.I.P., Stan. 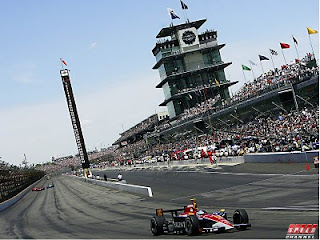 OK, how about this: that same year, 1994, I was lucky enough to be at the track during practice sessions and snagged an Indy 500 'hard card' sponsor credential, which essentially gave me access to every part of the track, including the on-track 'hot pit' area. That morning, while I waited for my credentials to be approved, I stood in the scrum of humanity at the edge of Gasoline Alley, watching the teams and cars and mechanics and drivers walking in and out of the pits to the track. I met about a dozen guys and girls in that crowd, all talking about their favorite drivers and stuff, and after a while I went back to the offices and got my hard card. Instantly, I was special.... the famed 'Yellow Shirt' track security staffers provided me full access wherever I wanted to go, so the pits were my first stop. After checking out a number of teams, I strolled down that special walkway between the pits and the track, along with all the other race dignitaries, but as I got part way through, I happened to walk past the same group of people that I'd been hanging out with. They spotted me and immediately began shouting my name, laughing and whooping and throwing me devil horns and the whole enchilada. I WAS SOMEBODY, whereas less than an hour before, I was just a regular dude. Indy does that to people. A side note: the team we were sponsoring failed to qualify that year, the first time Honda had attempted it, much to our disappointment... BUT I KNEW WHY. Turns out they'd been using the wrong type of spark plugs for an engine running on methanol, but the Japanese mechanics were too hard-headed to admit it and let the team down. I had mentioned the fact to the 'gaijin' mechanics who just shrugged because they weren't allowed to tinker with the engines. Lesson learned. I guess the point I'm trying to make is that sometimes, iconic events are hard to understand, their influence on people difficult to grasp, their meaning clouded in weirdness and superstition. For me, that day, walking with the kings of the sport in that place, even though I was just a sponsor and technician, I was a special person in a special place. I was in the clouds for the rest of that trip. It's probably a similar experience for the Super Bowl or the World Series, but those events are never at the same place. If you ever get a chance to visit and tour the track, DO IT. You'll find yourself watching the next race with a certain insider knowledge that is infectious. This year's 500 will be really, truly special. Four women have qualified and are competing head-to-head with the dudes, a first. Multiple 500 winner Helio Castroneves will attempt to win for the 4th time, raising him to the level of the sport's few legends who have done the same. The field of cars and teams are well-matched and, although there are the inevitable favorites, the race has a habit of confounding the prognosticators and raising mid-pack drivers from relative obscurity to worldwide recognition. That's how it goes at the 500. I'll be watching the race on Sunday, hoping for a safe and exciting race, hoping no one gets hurt, and time-travelling back to when I was a kid, watching the race with my Dad on our black and white TV, thinking of grand things like racing and life. Only this time, it will be with fine pastry and mimosas! "Ladies and Gentlemen, Start... Your... ENGINES!!!" Is it really that hard to figger out?